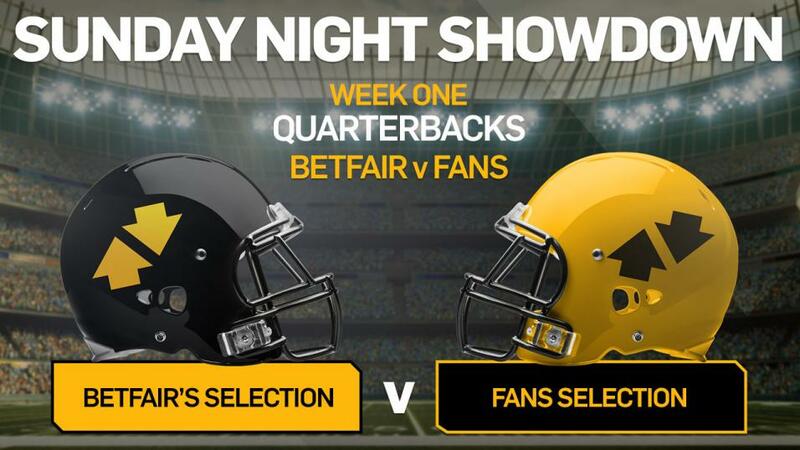 Can you take on Betfair's NFL tipsters? You can read all the T&Cs by clicking here. Each week you'll have the opportunity to choose between the top two players* in a given position (QB, RB, WR etc) to represent you in our Sunday Night Showdown. *The "Top Two" will be based on projected points according to the NFL Fantasy page. The player with the most votes will then take on OUR pick on Sunday Night Showdown. We'll then let you vote for who you think will come out on top; the Fan's player, or ours. If you correctly predict the Sunday Night Showdown winner - you'll be entered into a draw for a £25 free bet. Think you are smarter than our experts? Let's find out. Get voting.